Surf smelt are small marine fish native to the north Pacific. Their range begins in southern Alaska and extends down the coast of North America to southern California. Surf smelt often live quite close to shore, especially as juveniles. A schooling fish, they are found in many coastal estuaries along the Pacific coast, spawning in water as shallow as half a metre, usually on coarse sand or fine gravel beaches. 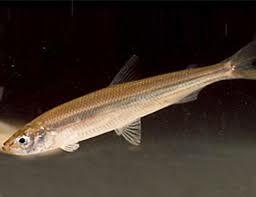 Surf smelt are small, silvery fish with a streamlined body. They have two dorsal fins, the first of which is flat and about midway down their length. The second is very small and close to their tail fin, which is strongly forked. Males and females differ in their colouration, with males having a brown back and yellowish underside and females a bright green back and white underside. Males are also distinguished by the tubercles on their flanks. Both sexes have a dark line that runs down their sides. Surf smelt can grow to about 20 centimetres in length. Smelt run onto the beach in breaking waves near the peak of an incoming tide, lay their eggs in the sand, then return out to sea on the next wave. Experienced surf anglers stand back from the breakers and watch for fish in the face of waves as they come into the beach. Bird and sea lion activity can also tip off smelt school locations. Smelt are usually found in lazy rolling waves rather than in big breakers that lead set of waves. Horizontal, dark lines of smelt can be spotted in the good waves as they run into shore. Smelt are often caught in several successive waves. Then the catch can taper off or disappear for minutes or hours, only to reappear without warning. Anglers move in and gather smelt from shore or piers with either gill nets, dip nets or throw nets. The dip net is worked into the waves as it rolls onto the beach. Lower cost throw nets are circular with lead weights around the perimeter and a draw string to close the net around the fish. The dip net take less practice and can be used in several waves before emptying. Throw nets must be retrieved, emptied, if necessary, and reset before each throw. The gill net is set from shore near the peak of an incoming tide and doesn't need to be emptied until the angler is ready to leave after high tide. Whichever net you use don’t just stand in the surf and “net” waves. All the commotion may actually discourage smelt from coming in. Experienced surf netters wear wet suits or waders. Bring along blankets, folding chairs, jackets, food, and flashlights or lanterns for night fishing. Bonfires round out the scene. You’ll also need buckets to hold your silvery catch. Smelt run from April through October, with the best action in June through August. Through surf smelt run somewhere just about every day in the summertime, the runs are very localized and, at times, inconsistent. So it is a good idea when planning a trip to the coast to call ahead. Tackle shops, bait shops, beaches, and private campgrounds near traditionally productive waters are all good sources of information. Spawning smelt prefer coarse, black sand beaches. Some of the best spots are where freshwater streams enter the Pacific. Smelt are frequently cooked whole, or they can be gutted and beheaded. Deep frying or pan frying of lightly floured smelt is a delicious treat. 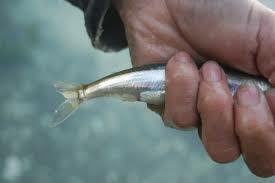 We hope that the information provided on this page makes you a better smelt angler. In case you’d still like to continue your research into smelt fishing we put together the below list of 3rd party websites. They should be sufficient for expanding your knowledge base. Surf Smelt – Wikipedia – Learn more about smelt on Wikipedia.